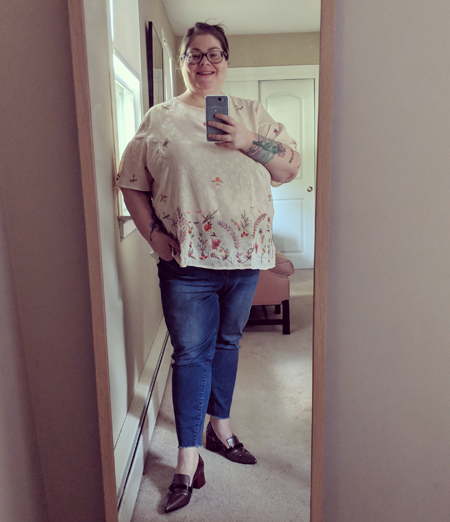 I'm wearing Simply Be's Embroidered Top with Fluted Sleeve; Torrid's Classic Ankle Skinny Jeans (which they don't appear to be selling with the rough hem anymore, but here's a similar pair); and Fluevog's Gigi in burgundy. I love this outfit because it's so effortless. Blouse, jeans, shoes. I got all three pieces during great sales. And I always get compliments when I wear this combination, despite its ease. Most importantly: I feel great when I wear it. Anyway! As always, all subjects related to fat fashion are on topic, but if you want a topic for discussion: What have you purchased lately that you loooooooove?